Ok – we realize that we’re taking a bit of editorial liberty with this one, and kicking someone while they’re down. It’s definitely a bit of Schadenfreude. Evidently hip hop artist Lil’ Wayne was recently hospitalized for effects suffered from drinking too much “Sizzurp” – a cocktail of cough syrup with Codeine combined with certain other things – like Jolly Rancher hard candies and Xanex. In other articles it was stated that, as an opiate, Codeine can be as addictive as other drugs in that class, like heroin. And the detox effects can be fatal. So perhaps none of this is exactly “Friday Funny” material, except in a kind of mean way. But, peep the image below from the LA Times – they have started inserting these ridiculous polls on EVERY news item. 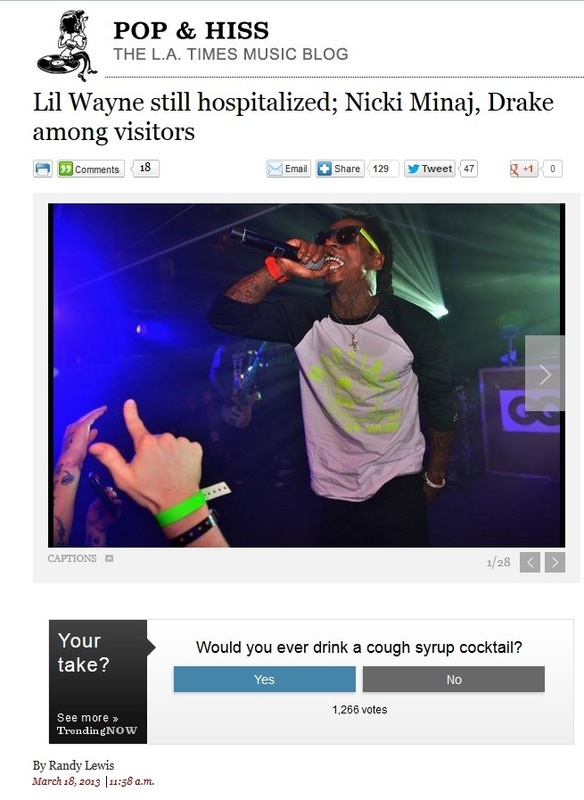 According to the poll of readers at the time we took the screen shot, a full 20% of readers would drink Sizzurp. Today we have perhaps our finest Friday Funny to date: The Brony. We just found out about this phenomenon yesterday thanks to our keeper of all things pop culture bizarre, our East San Gabriel Valley bureau chief. People younger than 40 probably remember the popular children’s franchise, My Little Pony. It was a classic cartoon/toy retail success, with the feedback loop of the cartoon inspiring the toys (small, colorful plastic ponies with wild hair colors), and the toys helping to popularize the show. Being of the male persuasion, I can’t say that I was a big fan, but my female contemporaries certainly were. The franchize has been revived as My Little Pony: Friendship is Magic. And this time, in addition to little girls, the show’s producers found an unlikely secondary fanbase: Bronies. Evidently birthed on 4Chan (a message board notable for spawning other incredible memes such as LOLcats, “Chocolate Rain,” and others, as well as the Project Chanology protest against Scientology, and for being a gathering place for the hacktivist group Anonymous), the meme picked up momentum and developed into a movement in its own right. Lest one believe that this is an internet-only fad driven by faceless crazies on 4Chan, we present perhaps one of the oddest fan conventions you could possibly attend: BronyCon. Notice that the presumably full-grown man in the right side of the foreground in the image above is sporting a pony tail on the seat of his jeans. Who could resist the urge to mingle with like-minded people like this? The following BOMBSHELL announcement from your friends here at RttRL is brought to you by a Google search on our blog’s name. An Austin-based musician named James McMurtry has a song named … Racing to the Red Light! I’m not a huge country music fan, but I like it! I must admit that I was confused when I first heard the report of some drug-crazed wacko in Miami who apparently chewed the face off of another similarly intoxicated homeless man, before police shot him dead. The other guy survived, sans face. Various media sources referred to the fact that the deranged face eater was high on a drug called “bath salts.” Indeed, there was some speculation in the media as to whether this was some kind of new drug (it is, I’ve since seen it described as being similar to synthetic cocaine), or if those nice smelling little jars of bath crystals could actually be smoked and turned one into a depraved psychopath. The MediaBistro article says that companies in the actual bath salts industry are being maligned by the illicit drug’s unfortunate nickname. Incredibly, one company has received calls requesting the drug, rather than the bathing crystals! I’d personally stay away from the drug. I read that it is similar to cocaine in some ways, but makes one prone to extreme paranoia and violence – never a good combination, but especially not when you’re not in the same reality as everyone else around you. Yes, this is real! As in, this is an actual, deceased pet cat that was stuffed by a taxidermist and then built into a remote control quad copter – a helicopter type aircraft with four smaller rotors. I spotted this on the L.A. Times website but I have since seen it elsewhere and even heard a bit on NPR about it this morning. I’m not exactly sure how to feel about this one. Certainly it is unique! And kind of funny. And of course morbid/unsettling.